The Iowa Indigent Care Program was created in 1915 as a safety net for low income Iowans who were not eligible for other health care programs. While a compassionate reason, the program served another purpose: supplying enough patients at University of Iowa Hospitals and Clinics for the UI’s medical training programs. All care, except for pregnancies dealt with closer to the patient’s home, was provided at the UI Hospitals and Clinics in Iowa City. Counties referred patients at no cost to the patient or the county. The counties had vouchers, leading people to use the term the State Papers Program, for the health care and the number of patients counties could send to Iowa City was limited, based on their populations. The state gave UI Hospitals and Clinics a fixed, annual appropriation but physicians were not reimbursed and the appropriation didn’t cover all hospital costs. In fiscal 2004 officials reported that the hospital waived $30.2 million in doctor’s fees for indigent care and $43.4 in hospital charges that could have been passed on to insurance companies. The state appropriation for indigent care that fiscal year, when 5,905 patients received free care, was $27.4 million, a report from December 2004 showed. State institutions could refer patients, too, through the Iowa Indigent Care Program. 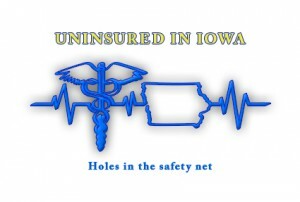 The federal government took action to end $65 million in funding to Iowa’s Medicaid program that helped fund the Indigent Care Program but the state negotiated an agreement with federal officials to match state spending two-to-one for all indigent care in Iowa. The agreement allowed for an expansion of Medicaid to reach more patients but also the establishment of IowaCare as a limited way to catch people who would not be eligible for coverage in the expansion.